FO: Counterpoint | Stitch, Brinn, Stitch! This post has been a long time in coming. FINALLY, this is the super secret knitting patten I’ve been talking about since probably July. Modifications: Went up a needle size because I didn’t want the scarf to be too difficult/uncomfortable to wear. Other than that, knit as written. I think I got 6.5 octaves. Now, I’ve knit some fairly complicated things in my knitting history. I’ve done cables and lace, sweaters with shaping, fiddly gloves, and I’ve used teeeny little yarn and fairly small needles. I’ve done color work and entrelac and all sorts of sewing up. All of this absolutely pales in comparison to this scarf, which is absolutely the coolest thing I’ve ever knit. 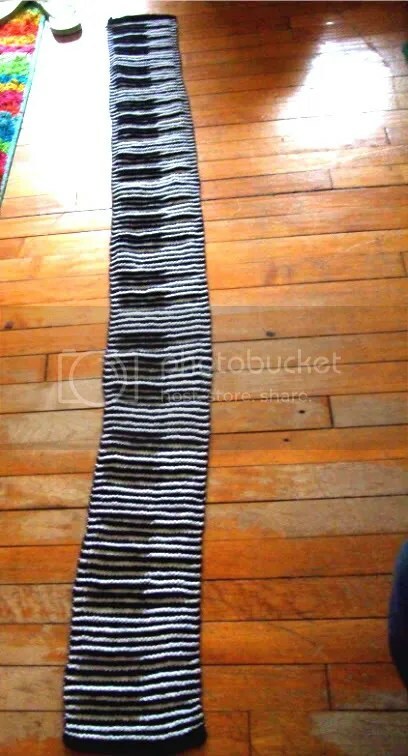 Now, I’m sure illusion knitting is old hat to many knitters, but I don’t care. This scarf probably took me twice as long to knit as it should have, simply because I couldn’t stop admiring it long enough to just knit the damn thing. It’s beautiful and wonderful and cool. This has been fairly long in the planning. 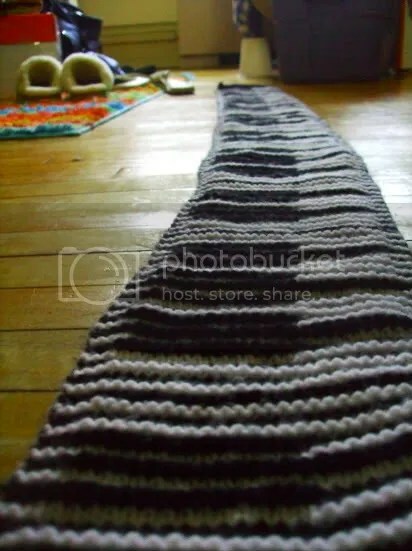 About a year ago, I was browsing Ravelry with my boyfriend in the room, and he thought this pattern was super cool. I’d made him a scarf for his birthday last year, but it was a pretty plain cabled scarf is Bernat Satin Soft – lovely, but nowhere near as nice as this particular pattern. I kept it in the back of my mind and didn’t actually buy the yarn until July. I started knitting in August, working on it off and on in between other projects, both on deadline and just because I wanted something different. I will say that there was a significant learning curve to getting comfortable with illusion knitting. I couldn’t knit a stitch without the chart and I had no idea which knits or purls were doing what and what was creating that super cool patterns. Then, all of a sudden, I got it. 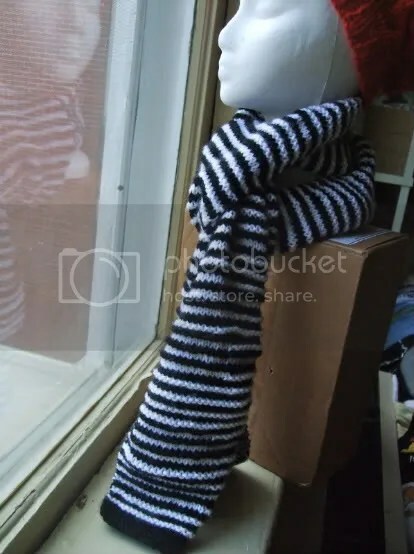 And now I’m fairly confident I could design my own illusion-knitted garment (though I find they’re mostly confined to scarves and dishcloths) fairly easily. My advice for those just starting illusion knitting, I would say to keep at it until it clicks. Because it will click. It just takes a little work first.